With Giffords In Courtroom, Jared Loughner Sentenced To Life In Prison : The Two-Way The 24-year-old was spared the death penalty because of a plea deal. Former Rep. Gabrielle Giffords' husband, the retired astronaut Mark Kelly, said that from now on, they are "done thinking about" Loughner. 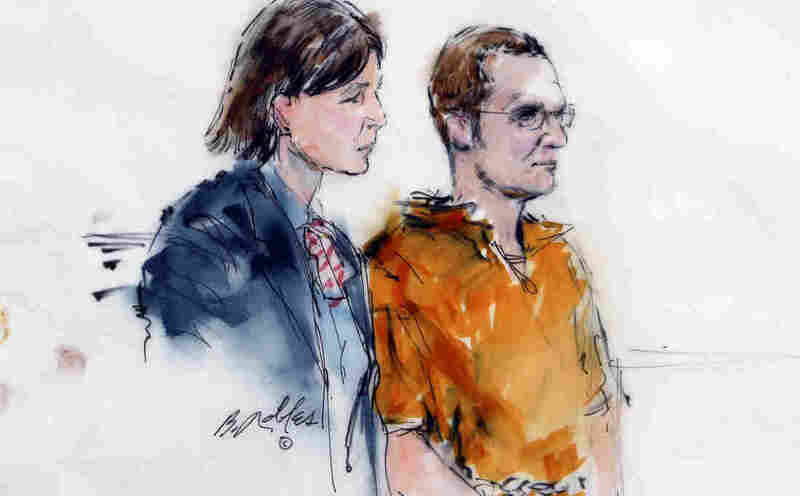 In this artist rendering, Jared Lee Loughner, right, makes a court appearance with his lawyer, Judy Clarke, at the Sandra Day O'Connor United States Courthouse in Phoenix, Ariz. in January. Jared Loughner, the 24-year-old who pleaded guilty to killing six people and wounding 13 others during a shooting spree at a congressional meet-and-greet in Tucson, Ariz., will spend the rest of his life in prison. Loughner was sentenced today as a U.S. District Court in Tucson, Ariz.
Before the judge handed down his punishment, victims and their families addressed Loughner and the court. Rep. Gabrielle Giffords, who was shot in the head during her event, looked directly at Loughner, according to reporters tweeting the proceedings. Her husband, the former astronaut Mark Kelly, spoke for her, according to Ryan Haarer a reporter for KVOA. "Everyday is a continuous struggle to do the things she was once so very good at," Kelly said as Giffords looked directly at Loughner. Kelly said that his wife struggles to walk, is "partially blind" and her arm is paralyzed. "Mr. Loughner, by making death and producing tragedy, you sought to extinguish the beauty of life. To diminish potential. To strain love. And to cancel ideas. You tried to create for all of us a world as dark and evil as your own," Kelly said according to his prepared remarks. "But know this, and remember it always: You failed." Kelly added: "Mr. Loughner, you may have put a bullet through her head, but you haven't put a dent in her spirit and her commitment to make the world a better place." Other victims said they understood that Loughner did not choose to have a mental disorder, but they did not understand his actions. Some of them said the mental health system let him down. Suzie Hileman, the neighbor who took nine-year-old Christina-Taylor Green, Loughner's youngest victim, to the event, told Loughner that she did not want to be standing at the sentencing. "I don't want to be here at all," she said. Then she looked at Loughner and told him it was all "because of you." "I forgive you," Hileman said. "But not the act." According to the reporters tweeting the hearing, Loughner sat through each statement without showing emotion. Haarer reported that he did not take his eyes off each speaker, looking "seemingly engaged." Federal Judge Larry Burns said Loughner was not insane at the time of the crime. "He knew what he was doing," Burns said according to The Arizona Republic's Wendy Halloran. So, he has no insanity defense. That's why Burns handed down a symbolic and "astronomical" sentence of seven consecutive life terms plus 140 years. Kelly finished his statement saying that Loughner will have decades to think about what he did. "But after today. After this moment. Here and now," he said. "Gabby and I are done thinking about you." Jared Loughner, the 24-year-old man who plead guilty to killing six people and wounding 13 others during a shooting spree at a congressional meet-and-greet in Tucson, will be sentenced shortly. Gabrielle Giffords, the former congresswoman from Arizona, who was shot in the head, is present at the hearing going on now in a U.S. District Court. With his plea deal, Loughner will avoid the death penalty. But The Arizona Republic reports that Loughner is expected to be sentenced to life. "Thursday, Loughner, now 24, will be sentenced in U.S. District Court in Tucson. Under terms of the plea agreement hammered out by prosecutors and defense attorneys in August, Loughner will spend the rest of his life in prison, and given his fragile mental state, most likely in a federal prison psychiatric ward. "Neither prosecutors nor defense attorneys are forthcoming with the details of the hearing, nor with the case in general." The paper is also tracking live tweets from the hearing. If you want to follow along, see this page. "In this state we have elected officials so feckless in their leadership that they would say, as in the case of Governor Jan Brewer, 'I don't think it has anything to do with the size of the magazine or the caliber of the gun.' She went on and said, 'Even if the shooter's weapon had held fewer bullets, he'd have another gun, maybe. He could have three guns in his pocket' – she said this just one week after a high capacity magazine allowed you to kill six and wound 19 others, before being wrestled to the ground while attempting to reload. Or a state legislature that thought it appropriate to busy itself naming an official Arizona state gun just weeks after this tragedy occurred, instead of doing the work it was elected to do: encourage economic growth, help our returning veterans and fix our education system. "The challenges we face are so great, but the leadership in place is so often lacking. In so many moments, I find myself thinking, 'We need Gabby.' In letter after letter, I've seen that others agree. As Americans mourned the six who died, they also mourned the loss of a representative who embodied the service they realized they should expect from those they elect, the type of person our county desperately needs to provide leadership and solve problems. Gabby was a courageous member of congress. Willing to stand up to the establishment when the establishment was wrong. She was thirsty for partnership across the aisle and was an unrelenting champion for her 600,000 constituents. One of which was you." According to several reporters tweeting the proceeding, Kelly is now addressing Loughner. "Everyday is a continuos struggle to do the things she was once so very good at," Kelly said as Giffords looked directly at Loughner. Kelly said that his wife struggles to walk, is "partially blind" and her arm is paralyzed. "You tried to create a world as dark and evil as your own," Kelly said according to the Arizona Republic's Sean Holstege. "Remember this: You failed." According to Ryan Haarer of KVOA, Kelly added: "You may have put a bullet in her head but you haven't put a dent in her spirit." The New York Times' Fernanda Santos tweets that after leaving the courtroom, Giffords is back. Wendy Halloran, of KPNX, is also tweeting the hearing. She reports that Suzie Hileman, the neighbor who took the youngest victim to the event, told Loughner that she did not want to be standing at the hearing. Fernanda Santos, a correspondent for The New York Times, is tweeting the proceedings. She reports that a forensic psychologist treating Loughner said he was competent enough to proceed. Giffords, reports Santos, left the court room "as second witness testified, not even 20 min into the hearing. Seems like she couldn't take it."